The Performance of Concentrated Solar Power (CSP) Systems: Analysis, Measurement, and Assessment offers a unique overview of the information on the state-of-the-art of analysis, measurement, and assessment of the performance of concentrated solar power (CSP) components and systems in a comprehensive, compact, and complete manner. 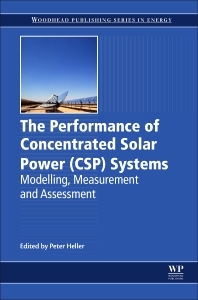 The Performance of Concentrated Solar Power (CSP) Systems: Analysis, Measurement, and Assessment is an essential reference text for research and development professionals and engineers working on concentrated solar power systems, as well as for postgraduate students studying CSP. Dr Peter Heller is Head of the Department of Qualification at the Institute of Solar Research, German Aerospace Center, Germany.